I’ll admit I was a bit discombobulated the morning I made headlines on my employer’s homepage a salute to the Tennessee Volunteers. The anguished shrieks from co-workers told me orange text wasn’t necessarily a good pick in Central California, and my nervous fingers couldn’t type quickly enough to backpedal out of that mistake. The pressure of unscrewing a screwup before the world sees it is nothing, though, compared to what I’ve been through the past few days. Big Guy has decided he’s interested in art. Oh, crap. It was yet another reminder of how parenting persistently unearths long-forgotten weaknesses and parades them down Main Street. I can’t draw. Not even a straight line. People have been pointed that out since before I started school. I was notorious when I designed newspaper pages for producing the most indecipherable layout sketches in the history of publishing. “Have you considered investing in a ruler?” a frustrated compositor asked me one morning as he squinted and tried to figure out where a story should end. “I do use a ruler,” I replied as he shook his head. I’ve survived the past five years by limiting my sketching to “happy flowers” with bathtub crayons, figuring a wet curvy surface justified my sloppiness. But then came Big Guy’s homework this week: Write and illustrate a book. He was to use the two partial sentences he’s learned — “I can see” or “I like” — and finish the thought with a picture. I didn’t want to complain, because it was a much-welcome addition to flash-card drills. I knew the time would come, though, when I’d be forced to apply pencil to paper and expose a glaring weakness to my darling son. Both of them, actually, since Little Guy’s decided to “help” with homework. The first two days were cake. He also had lengthy worksheets those nights, so when it came time to work on his book he glanced out the window and sketched the first thing he saw. A tree. How about we start by calling someone who has a clue? Remembering what I always tell him to say — “I don’t know if I can. But I can try.” – I gamely picked up the pencil. Swing set, I thought, quickly and crookedly drawing two inverted V’s connected with a line. A few more lines and some connecting squares and, voila. Swing set! Which, of course, was insufficient. Kids. OK. I can handle that as long as my hands don’t drip sweat onto the paper. Tunnel slide. Great. My tiny task master now was assigning work involving perspective and a million other things that simply escape me. Suddenly, I understood why Van Gogh cut off his ear. I would have been willing to lose quite a few body parts to get out of this. Curvy ladders complete, he grabbed the paper for a thorough critique. His furrowed brow told me I wasn’t finished. “There’s no more room,” I pleaded. It was almost true. “Then put it on the top,” he insisted. Teeter-totter on top. Then butterflies and the sun. I called a halt when there wasn’t room for a single additional critter or kid. “Your turn,” I said, pushing his book his way. 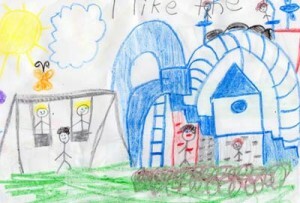 He colored grass, drew a swing set and declared it finished. “All anyone really needs at a park is a swing set,” he said. Miraculously, I let him live.